I know some of you can relate. Maybe you had braces on your teeth. Maybe you were a little too nerdy. Maybe you didn’t wear the right cool clothes. And maybe you didn’t get invited to the cool kids’ parties. I didn’t. The good news is: We’ve reached 100+ participants for the November 1 event! The bad news is: we are no longer accepting new blogs. Since I’m almost a grown-up now, I will take the mature, high road. So here’s a vegan recipe that is simple, delicious, and a crowd pleaser. I can’t take credit for this one, so I give due diligence and site my source, Summertomato.com. I came across this recipe because I made a dish with delicata squash, and had some left over that I wasn’t keen on just shoving in the fridge to be forgotten and lost to the slime monster. So I quickly searched for a simple recipe that could make use of an odd amount of squash. If you like sweet potato fries, you will love these. By the way, it’s kind of a miracle that I caught a photo of these things, because they disappeared as soon as they were not burning our mouths. 1. Preheat the oven to 425. 2. Clean the squash thoroughly with warm water. This squash doesn’t require peeling, so you want it to be really clean since you will be eating the skin. 3. With a sharp knife, cut the squash in half lengthwise. Scoop out the seeds and cut the squash into 1/4 to 1/2 inch slices. 4. 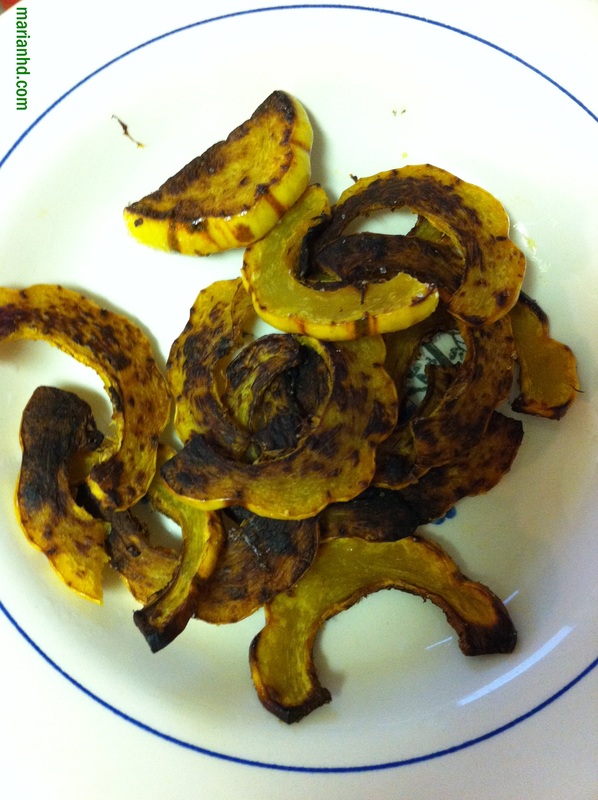 Put the squash in a bowl and drizzle olive oil over the slices (doesn’t take much) and toss to coat. 5. Lay the slices out on a metal baking sheet without pieces touching if possible. Sprinkle with salt. Roast in the oven for 10 minutes, then remove from the oven and turn each piece carefully. 6. Put the squash back in the oven and roast for about another 8-10 minutes. After 20 minutes total, my squash was perfect, but the original author recommends a total of 25-30 minutes. Use your judgement and perhaps a taste test to see who you think is right. Previous Post Previous post: BOO-ba Ganoush! Those were amazing! Glad you liked them too.